The Evenheat RM II 2329 ceramic kiln is a true studio-size kiln. The huge 7.5 cubic foot chamber (23.5" diameter x 29" depth) can fit even the largest pieces in the studio. The RM II 2329 is designed to fire up to 2300F / cone 8 and uses 2-1/2" thick bricks for excellent efficiency and temperature distribution. For accurate, multi-zone temperature control, this kiln comes equipped with either the Rampmaster II or Set-Pro controller. Features like a full stainless jacket and corner mounted hardware give the machine a lasting durability. The RM II 2329 comes with a free 2 year warranty. Utilizes a maintenance line to split in the jacket for ease in element replacement and kiln installation. Simply remove the screws and separate the sections for easy internal access. 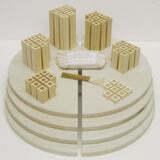 Eight (8) each of 1", 2", 3", 4", 5" and 6" Posts. All posts 1" square.